Gather your thoughts by gathering your favorite pictures and inspiration is at your fingertips! 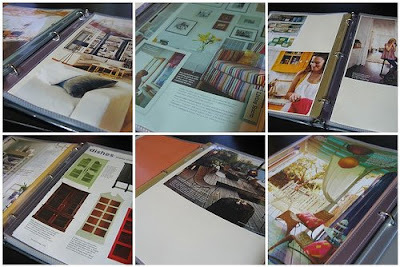 Materials: 3-ring binder, dividers w/ tabs, clear pocket binder sheets, glue, scissors, magazines, pictures, drawings, etc. Decide how you want to organize your book. My book is for home design inspiration so my tabs reflect the rooms in my house. I chose to print out labels to use in my binder tabs. You could just as easily write out the tabs yourself. Some tabs are even formatted to run through a printer. Just remember to print out two of each label so both sides of the tab are labeled. 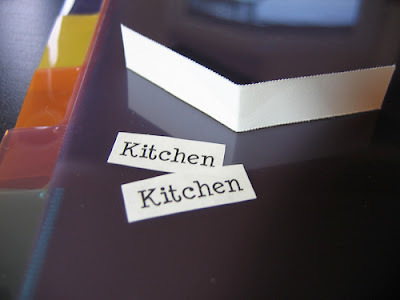 If you decided to print out your labels trim them up so they fit on the tab insets included with the binder dividers. 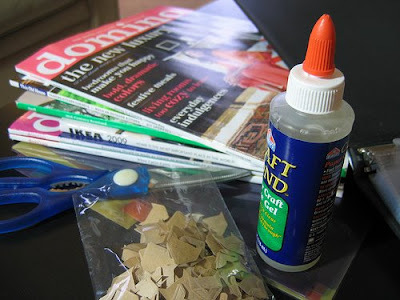 Use glue or tape, whatever you have around, to stick the labels to the tabs - one on each side so you can see them no matter which way you flip through your book. 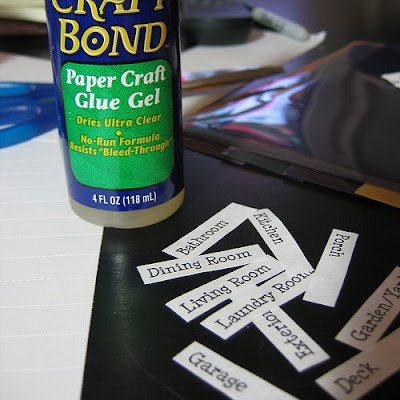 I used a glue specifically for paper crafts (Elmer's Craft Bond). 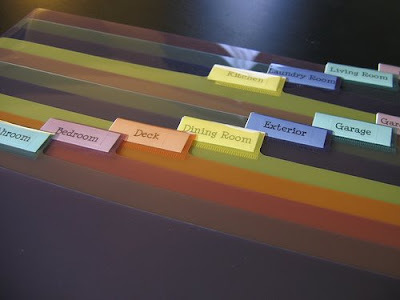 Insert your labeled tabs into the dividers - oh, so pretty. 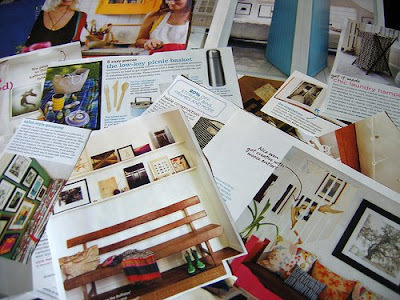 This is an exercise in consolidation so gather up your favorite magazines, pictures, drawings, blog posts - anything you've been holding on to or frequently look to for ideas. Clip away! 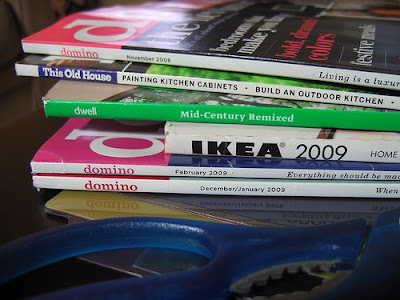 Once you have all your favorites clipped out throw all those stacks of old magazines away! 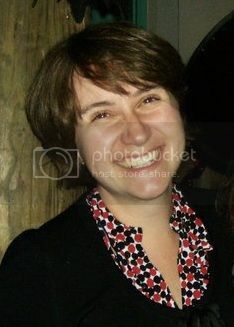 Aaah, isn't that liberating? After all everything you refer back to those stacks for is now in a neat little pile on the table. The good thing about clear plastic binder pages is they're perfect for magazine articles - you can still see both sides! 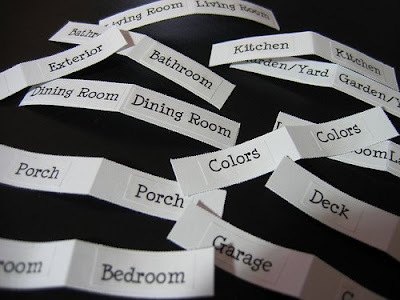 Bits and pieces that aren't full pages can be glued/taped/stickered to printer paper, even construction paper for more color. 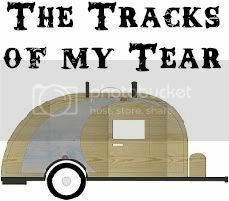 You can even scrapbook it up with text, photo corners, anything you want. Now categorize your pages under the correct binder heading and voila! You're finished! At least for today. Add on when ever you feel the urge. Tell me about it! It makes it soooo much easier to find what you're looking for.